JY20: Let the tournaments begin! Everybody’s favorite part of the high school hockey season is tournament time. By which, I mean the state tournaments that take place in late February and early March. But tournament time happens in December, too, with holiday tournaments taking place throughout the state. Although they start this weekend with the 68th annual Lawrenceville Tournament, that’s for boarding schools. The regular kids start playing tournament games Sunday night, and they come in all shapes and sizes. OK, this is not relevant to anything currently going on, nor is it told in sequence with my other looks into the past, but for some reason, this nuance from high school keeps coming back to me. Having enrolled at Delbarton in 7th grade, when I was already a fan of the hockey team, I was attached to them from the get-go. I began covering the MCSSIHL (Morris County league) in 8th grade, but I had no official affiliation with the team itself. I wanted the fan experience. For a lot of games, I would stand with the Delbarton student section (a cherished tradition) and scribble notes to myself, then get boxscores and deal with actual recaps after the fact. For bigger games, I might sit off to the side and take notes, but it was no secret where my loyalties lay. But Doug Skinner, the excellent, very professional student manager, graduated after my sophomore year, and it was a natural step for me to take over for my junior and senior years. This involved one conversation with our head coach, Brian Day, when he asked if I could keep the locker room, the team, and any inside information separate from my newsletter. I told him I could, and I had the job. I loved being an official part of the team. I didn’t go to practices (thank God! ), but I wore a tie with the players on gamedays, went on all the road trips, manned the penalty box during the game, and was in the locker room before and after every period. I already knew most of the players, but being around them more and going on the trips was terrific. I took my fair share of teasing and schtick, like any manager, but I was part of the group. My duties included keeping statistics, charting shots, turning in the starting lineup, reporting game results to the newspapers, etc. I already knew how to do virtually all of this from my hockey work and from filling the statistician’s role for football and soccer. At some point, the coaches asked me to add passes completed/attempted to my repertoire, as well as turnovers in the defensive zone and the first 10 feet of the offensive zone. This got tricky and pretty intense, but I set up a system in my binder and found a way to do it. My least favorite part of the job was the water bottles. All teams keep water bottles in the bench areas for guys to grab between shifts. Managers had to fill them up before the game, carry them out to the bench, and re-fill them between periods. No big deal, right? Well, thinking back to previous years in which multiple players on the team had gotten sick at the same time, Coach Day decided that each player needed to have his own, dedicated water bottle. This way, they wouldn’t exchange germs. So I had to label the water bottles, keep the screw-off tops matching each player’s bottle, and keep them organized. At first, I tried writing the players’ numbers on the water bottles themselves with a sharpie. As wonderful as those markers are, this didn’t work. With red water bottles and a glossy surface, I had to trace over each number several times to even get it to show up. Once you could (sort of) read them, the numbers wore off relatively quickly, especially since each bottle was getting rinsed 3-4 times per game as I filled and re-filled them. My next solution was to wrap white tape around the top of the bottle and then write each player’s number on the tape, to make it more lasting and more clearly visible. This, too, had drawbacks: the tape would get soaked and peel off. But at least it was repeatable, so I would check before a game and tape over any pieces that looked shaky, giving them a fresh layer and re-labeling with the correct number. It also meant made it easier to change the number or add a new one if a player got called up from JV. We had a crate in which to carry the water bottles, so I would keep them in the crate in numerical order to stay organized, with the water bottles for each goalie resting on top, to be handed out on their way to the ice. But when arranging the water bottles on the bench (also part of my job), you need them to be in the right spot – forwards closest to the offensive zone, defensemen closest to the defensive zone. So I would place them on the right side of the bench, keeping line combinations and defense pairings together. Of course, players from the same line wouldn’t necessarily sit together. And, to be honest, I have a feeling players just used whatever water bottle was in front of them, without worrying about the numbers. I seem to remember Coach Day chewing them out one time for doing just that. So I’m not sure how necessary / effective all that extra work was. But I do remember frantically kneeling next to a sink, trying to re-fill the water bottles as quickly as possible during those five-minute breaks without an ice cut at Mennen. I remember giving the guys hot water once, up at Sport-O-Rama, because the locker room somehow didn’t offer cold. I remember frantically searching for a water fountain up at Milton Academy during a road trip, because our locker room had no sinks. But probably my favorite water-bottle memory is the time our student trainer, a stocky guy, did me a favor by carrying the crate out to the ice for the second period. This was up at Middlebury, at a tournament in their fancy new arena, and I was back in the tunnel to the locker room. Like any high-level rink, you can’t see the ice from there. Going out to help, I turned the corner toward the ice, and I just saw red water bottles rolling across the rink. Our trainer had slipped and fallen on the fresh ice, dropping most of the bottles in the process! I’m not sure I’ve ever laughed so hard in my life. After I helped him pick them up, of course. Never a dull moment in hockey, even with something as simple as water bottles. So if I’m going to do this – reflect on 20 years of covering high school ice hockey in New Jersey, while looking at the 2015-16 season as landmark year No. 20 – I should probably start at the beginning. How did I, someone who has never played a game of ice hockey in my life, someone who had never even been on skates, wind up so consumed by this little corner of the sport? Monday marked the first day of practice for high school ice hockey teams in my home state of New Jersey, which means, in 2015-16, that it marks the beginning of my 20th year covering those teams. The milestone is bittersweet, because it will probably be my last year covering New Jersey high school hockey for Hockey Night in Boston and maybe even the last year of my website, NJHockey.org, which I have run since I was a freshman in college in 2001-02. Increasing professional and family responsibilities mean less free time for the ‘hobby’ role that hockey takes, and while I am thrilled about everything going on in my life, it will definitely be strange for me if and when I am absent from the New Jersey hockey scene. 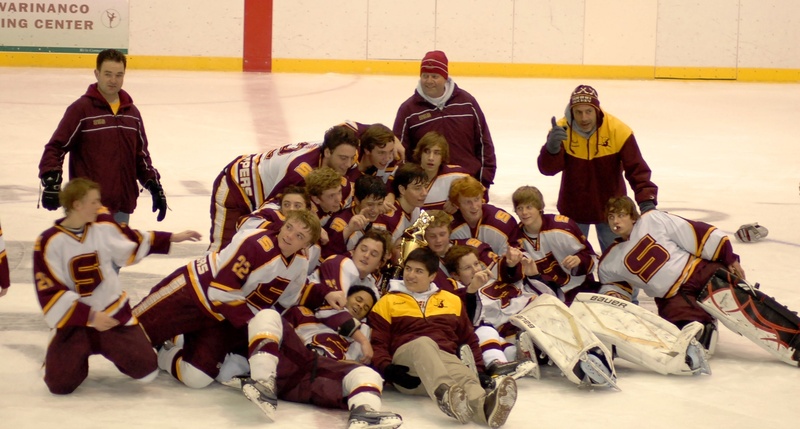 Over the years, I have been asked countless times – by coaches, parents, friends, roommates – WHY I keep track of every game played by boys’ varsity ice hockey teams in New Jersey. Why I stay up almost every night for four months inputting scores into three separate spreadsheets. Why this continued when I lived in Texas, Pennsylvania, and Louisiana and I saw very few games in person. Why I’ve continued to track and monitor a fairly average group of players and teams (no offense, guys!) in a sport that does not rank among New Jersey’s or the country’s most significant. “I can’t imagine not doing it,” has probably been my most frequent response, and it’s true. If I stopped running my website, then decided in January that I wanted to know who was in first place in the Mennen Division, or how East Side was faring this season, how would I find that information? Would it be accurate? How often would it be updated? Would it reflect game results the way I would list them? But there’s much more to it than that. For the last 20 years, despite never having played or coached the sport, I have been welcomed and accepted into a unique community of New Jersey hockey people. They rely on me and talk the game with me, and we all enjoy that. But they also root for me and support me and ask how they can help, and there are many I consider friends. Walking into a New Jersey hockey rink — most of them, anyway — feels like coming home. It is a community I cherish and love and will never forget. Why do I love it so much? Maybe this 20th year of coverage, in which I intend to increase my published writing at blog.njhockey.org and continue to provide Twitter updates via @NJ_Hockey, will be my way of trying to explain and document why and how New Jersey high school ice hockey has been an integral part of my life every winter since before I even reached high school. Thanks for reading, and enjoy the season!